The amount of old electronics we throw in the trash is gross, and now a new report from the United Nations University quantifies the extent to which we’re discarding iPods and rusty washing machines. 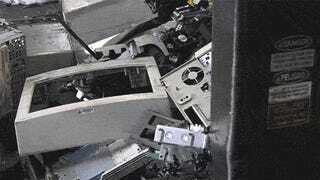 In the US alone, we tossed out 7.1 million metric tons of e-waste, or nearly 16 billion pounds. That means we created a digital-goods graveyard in a single year larger than the Great Pyramid of Giza, which is around 13 billion pounds. Globally, people produced 41.8 million metric tons of e-waste in 2014, or over 92 billion pounds. That’s more than seven Great Pyramids’ worth of crapped-out Blackberry phones, forsaken Toshiba TVs, and human misery. Considering that the amount of gold found in e-waste is equivalent to 11% of the amount of gold produced in mines each year, we’re missing out on recovering a host of valuable materials. Worse yet, the hellish underground economy that has sprung up around international e-waste dumping grounds in China and Ghana is leading to “environmental catastrophes.” Since only 15% of the e-waste produced is properly recycled through take-back programs, most of the electronic detritus gets dumped without meeting pollution and waste standards. The dumbing ground of Agbogbloshie, Ghana, is so polluted people refer to it as “Sodom and Gomorrah.” It’s one of the most striking places to see what happens when we don’t regulate waste—a wetland-turned-garbagehell where people wade through the toxic smog of broken laptops and busted washing machines to salvage valuable materials like gold.